Why use GreatCollections Coin Auctions and Rare Coins? Collectors, dealers and investors use GreatCollections Coin Auctions for coins ranging in value from $20 to $100,000 and up. GreatCollections for $79,750.Whether you are looking to buy or sell rare coins or other numismatic items, GreatCollections can help you. Our knowledgeable and experienced staff can identify and value your coins and also help collectors acquire coins in our auctions or for direct sale. One of our company philosophies is to offer coins of all prices and without any minimum to the consignor. Our belief is that collectors need a venue they trust to buy and sell coins of all prices, from famous rarities like this $80,000 Panama Pacific Commemorative, just as much as this $45 Morgan Dollar. We are committed to servicing the needs of all aspects of the coin market. 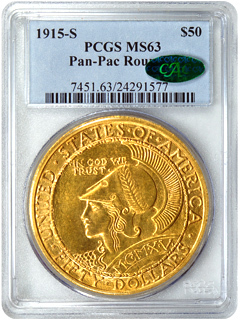 GreatCollections offers a wide selection of certified coins graded by PCGS, NGC and ANACS. Unlike all of our competitors, GreatCollections discloses the minimum bid/reserve from the moment the coin lists on our website. There are no hidden reserves, ever. The lowest fees, whether buying or selling. No other coin auction company comes close with our lower buyer's fee and low or zero seller's fees. We eliminate the risks with buying and selling coins online. All transactions are confidential and handled through GreatCollections. Fast shipping of orders/auction wins. Most orders paid by 12:00 noon Pacific Time will ship same day. For consignors, the fastest turnaround of any coin auction company. Coins list in a matter of days, and payment is routinely sent within 7-10 days of auction. Advanced website technology, keeping consignors and bidders informed throughout the auction process. A complete Coin Auction Archive, 623,958 coins in our price guide for U.S. and World coins. This important research tool for rare coins is continually updated as we close auctions each week. GreatCollections offers discounted grading rates as an authorized submitter at PCGS, NGC, ANACS and CAC. In addition, GreatCollections is a life member of the American Numismatic Association, FUN and a member of the National Auctioneers Association.